As President Obama looks to shift the U.S. away from coal power and towards renewable energy in America’s Clean Power Plan, the Washington Post has put together this fantastic map that details every power plant in the United States. Covering electricity generation from January to May, 2015, the map brings to light some interesting details; such as noting that the 34 percent of the nation’s power produced by coal comes from just 511 plants, in contrast with the 1,740 natural gas-powered electric plants that have produced 30 percent of power. As we know, renewables have a long way to go, but the break down of solar, wind and hydro projects make clear which direction individual states need to move in. Check out the full article at the Washington Post for a great overview of our nation’s power sources. 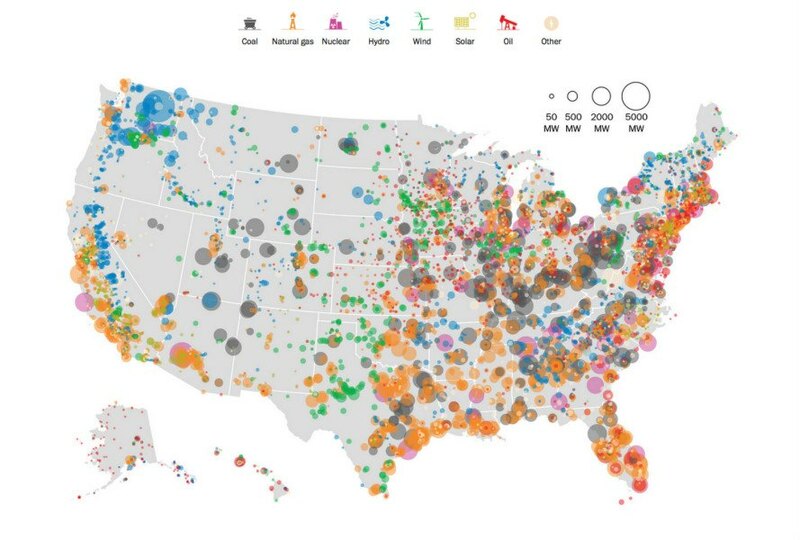 As President Obama looks to shift the U.S. away from coal power and towards renewable energy in America's Clean Power Plan, the Washington Post has put together this fantastic map that details every power plant in the United States. Covering electricity generation from January to May, 2015, the map brings to light some interesting details; such as noting that the 34 percent of the nation's power produced by coal comes from just 511 plants, in contrast with the 1,740 natural gas-powered electric plants that have produced 30 percent of power. As we know, renewables have a long way to go, but the break down of solar, wind and hydro projects make clear which direction individual states need to move in. Check out the full article at the Washington Post for a great overview of our nation's power sources.